EAST RUTHERFORD, N.J.—Denver corner Aqib Talib picked off an ill-advised Geno Smith throw and returned it 22 yards to the end zone with just 15 seconds remaining to seal Denver’s 31–17 win and hand the Jets their fifth straight loss of the season, in a real downer of a game for Rex Ryan’s club. “We want it in the worst way. Obviously, we want it for ourselves, we want it for our fans. Man, it just doesn’t seem like we can get it going right now,” said a frustrated Ryan afterward. It wasn’t how the Jets wanted this one to go, especially after last week’s 31–0 disaster at the hands of the Chargers. The Jets again were woeful on offense. New York ran for just 31 yards on 15 carries as the Broncos dared Geno to beat them with his arm. The second-year starter from West Virginia was just 23/43 passing for 190 yards, a pair of TDs, and the late interception. “We’re struggling a bit offensively. Especially running the football,” Ryan said. The problems in the passing game weren’t just on Geno, though, who was sacked four times and under pressure several others. He was also victimized by several drops. One was by rookie tight end Jace Amaro who still finished with a career-high 10 catches for 68 yards. 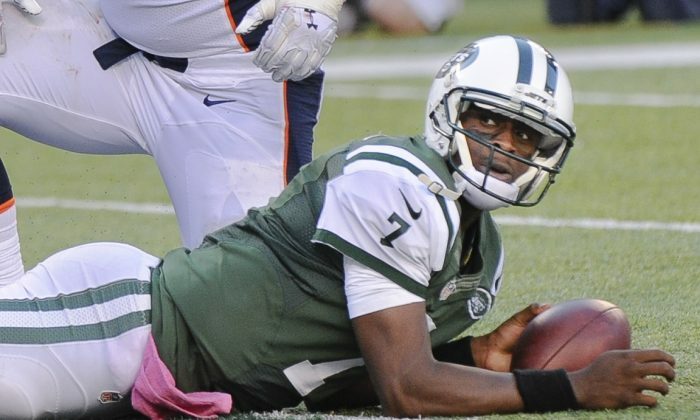 But in the end, Geno was unable to move the chains, even once, on crucial back-to-back fourth-quarter possessions after the Jets cut the lead to one score at 24–17. On the other side, Peyton Manning had his way with the Jets defense. It didn’t help that the Jets lost second-year corner Dee Milliner to an Achilles injury on the fifth play of the game. Ryan didn’t say how severe the injury was, but Milliner didn’t return. Meanwhile, five-time MVP Manning finished 22/33 passing for 237 yards, 3 TDs, and zero picks as the Broncos out-gained the Jets 359–204 in total yards. Manning is now just two behind Brett Favre’s all-time record of 508 career TDs. The Jets had their chances to take control of the game in the first half. Armed with a 7–3 lead early in the second quarter, Rex Ryan’s crew had the Broncos punting at their own 13, courtesy of a holding penalty and then a sack by Leger Douzable. But newly signed rookie punt returner Walt Powell muffed the punt, which Denver recovered at the Jets 43-yard line. Ryan’s defense hung tough on the next sequence, limiting Manning and company to another three-and-out, and the Jets got the ball back at their own four. But Geno and the offense mustered just three yards in three plays before punting it back to Denver—and this time the Broncos made them pay. Manning found Demaryius Thomas for a one-yard score to put Denver up 10–7. It would be the first of three straight touchdown drives for the offensive-minded Broncos, who went up 24–7 midway through the third. A Nick Folk field goal late in the third, and then an Eric Decker two-yard TD catch from Geno pulled the Jets to within 24–17 with 7:56 left, but the Jets would get no closer.